Oils labeled "expeller-pressed" have much in common with those labeled "cold-pressed," including proper storage procedures and even some of the same uses. However, their respective production processes lead to differences in cost, flavor and some cooking uses. All cold-pressed oils are expeller-pressed, but not all expeller-pressed oils are cold-pressed. Both oils are derived by the crushing of their source -- seeds or nuts -- but cold-pressed oils are pressed from the food item under cooler temperatures for minimal heat damage. This process leaves cold-pressed oils bolder in flavor and aroma than other expeller-pressed oils, and also makes them more expensive. Use cold-pressed oils unheated to preserve their flavor; drizzle over salads or cooked veggies and meats. Cold-pressed olive and walnut oils, for example, are often used in salads in place of conventional dressings. Other expeller-pressed oils, such as canola, incur more heat during the pressing stage and can be poured unheated over vegetables and meats or used in frying, sauteing or baking. Take care to keep cold-pressed and other expeller-pressed oils sealed in airtight containers, away from heat and sunlight, to protect their flavor and nutritional value. 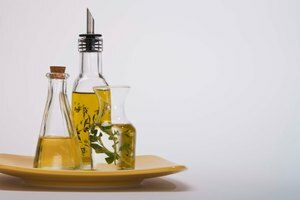 Whole Foods: What Are Cold Pressed Oils? Whole Foods: Is It OK to Cook With Extra-Virgin Olive Oil?